Listed below are the PADI Specialties offered by the Instructors at Go West Diving. 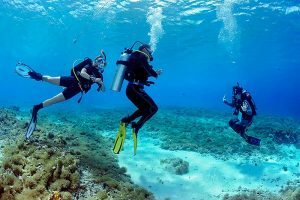 Specialties vary in price depending on the number of days involved, with one or two days being the norm, and whether the dives involve shore diving or boat diving. Port side, Starboard, Pantry and Stern…. These are just a few words you might have heard of in your life near the water. But do you also know what they mean? Or is it just some slang that only the captain should know? Knowing the boat you are on, will make your dive safer. Not all of the do’s and don’ts of boat diving are obvious. Neither is boat diving etiquette! So we’ll go over everything from pre-boarding through to waving the captain goodbye. You’ll enjoy your boat diving experience more – as will your boat-mates!